Preheat oven to 350°F. Spray 9-inch springform pan with nonstick cooking spray. Combine crumbs and margarine in medium bowl. Gently press crumb mixture on bottom and 1/2 inch up side of pan. Bake 8 to 10 minutes or until lightly browned. Cool completely on wire rack. Spread ice cream evenly in cooled crust. Freeze 30 minutes or until firm to the touch. Spread orange sherbet evenly over ice cream; freeze at least 1 hour or until firm. To serve, run knife carefully around edge of pan; remove side of pan. Cut into 10 slices. 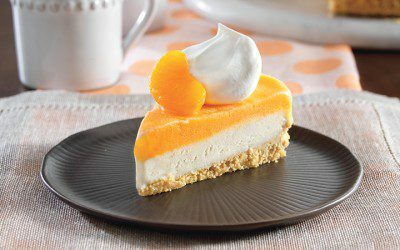 Top each slice with 1 tablespoon whipped topping and 1 orange slice. Serving size: 1/10 of pie. Exchanges per serving: 2 Diabetic Carb Count, 2 Bread/Starch.